One of the best things about working for yourself is being able to slip out of the office (aka the spare bedroom) on a slow morning and drive into the countryside for a cheeky coffee break. That's what my husband Mike and I did early last week when the sun was shining and we were both feeling the need to step away from our computer screens for an hour or two. 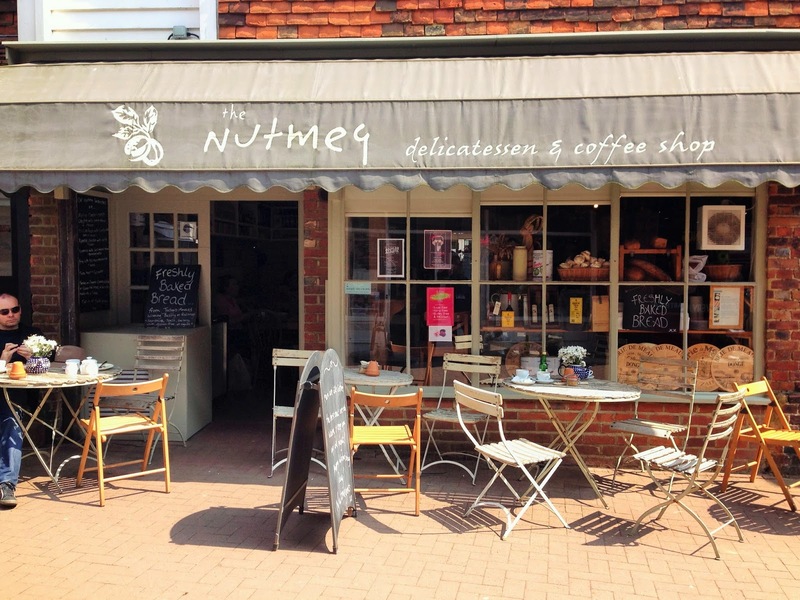 We live in East Kent, and one of our favourite things to do is visit the different towns and villages in our local area, trying out the various cafes and restaurants. 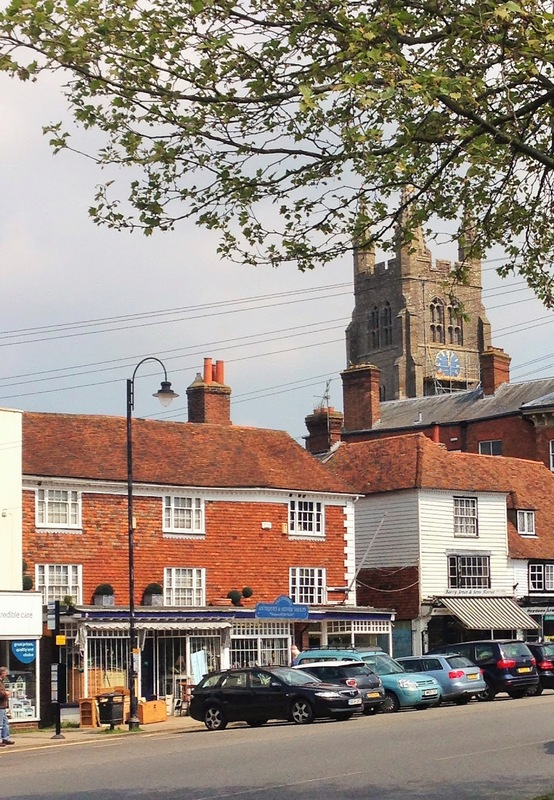 Tenterden is a busy little market town with an interesting high street and lots of quirky, independent shops and eateries. We always enjoy a drive out here and a wander around, not to mention a hefty chunk of cake at one of the many cafes in the centre. On this occasion we decided to go to The Nutmeg. 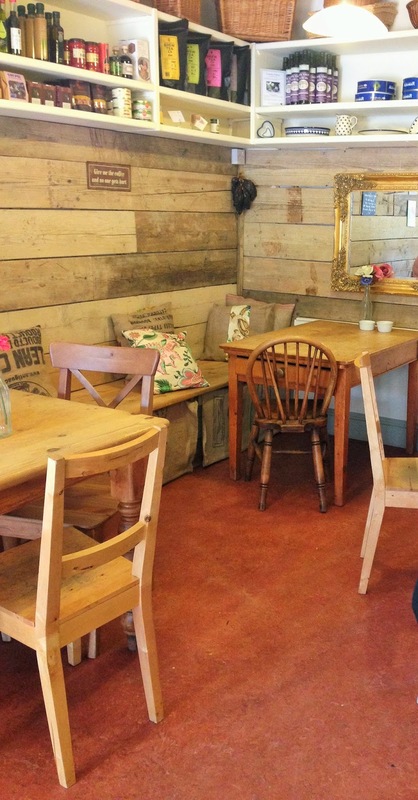 Located just off the main high street, it's a small but beautifully formed deli and coffee shop and boasts a counter stuffed full of tempting homemade treats. 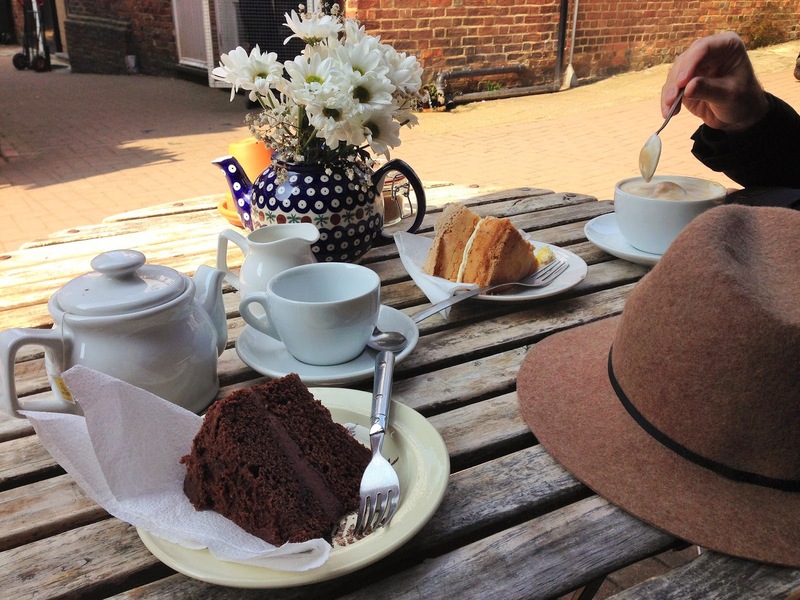 I had a pot of tea and a delicious slice of chocolate sponge. The buttercream in particular was beautiful and I could have eaten a bucket of it... though I would quite possibly have regretted that afterwards. Mike had lemon cake and a cappuccino, both of which he gave a very definite thumbs-up. I'm not really a coffee drinker, but if you are and you're in the area you may be interested to know that this place has some excellent reviews for the quality of its coffee on Tripadvisor. As the sun was shining we enjoyed sitting outside, though the inside is well worth a nose around. Despite having only a tiny space to work with, the owners have created a very inviting, cosy environment and have clearly lavished a great deal of care and attention on making the place beautiful. Afterwards, we took a little stroll along the high street to walk off the cake. Then, sadly, it was time to go home and get back to work. 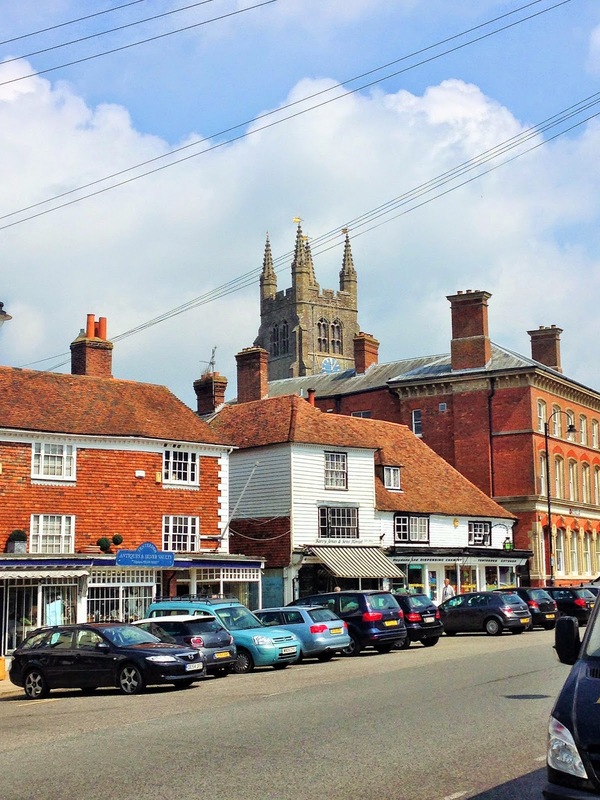 Have you ever been to Tenterden? What did you think? What a darling coffee shop. The sponge cake looks delish! 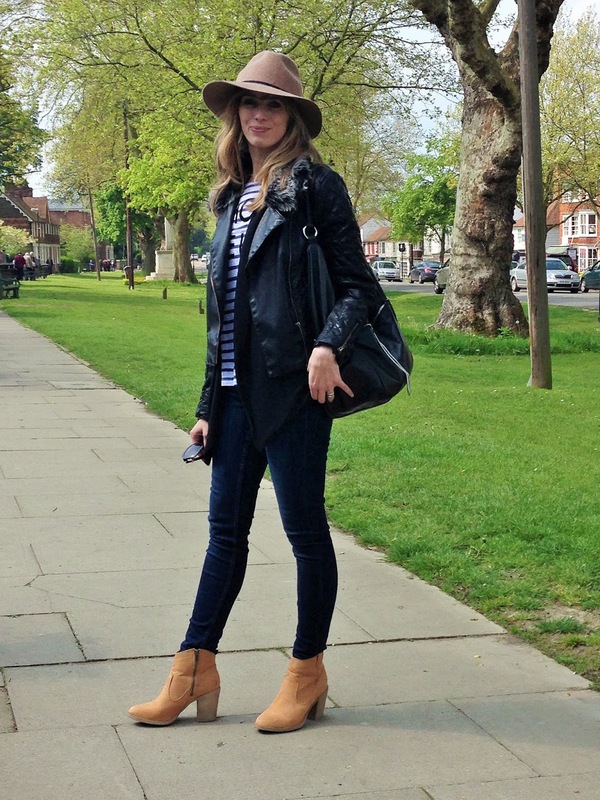 I like outfit....it looks so relaxed and I absolutley adore the booties. Such a cute place, love your hat too. Such a great outfit --I absolutely love it! So classic and perfect for mozying around town! Not to mention, all of your little stops look so fun and adorable. I wish there were cutesy little places like that in Springfield!